The second biggest city in the state of Okalhoma and the 47th biggest city by population in the entire United States, Tulsa is a popular city in which to live and work. Located mostly in Tulsa County, but also extending into Wagoner County, Rogers County, and Osage County, Tulsa is home to over 400,000 people, with close to a million in the surrounding metropolitan area. The city of Tulsa was founded in the early 19th century and was known as the 'Oil Capital of the World' for many years due to its booming oil industry which played a major part in the economic and industrial development of Oklahoma overall. Situated on the Arkansas River and right by the Ozark Mountains, Tulsa may have a history and reputation associated with oil and industry but is also a prime location for nature lovers and outdoor enthusiasts, with lots of beautiful natural sites to be seen and enjoyed in the surrounding area and lots of fun outdoor activities to be enjoyed. The city of Tulsa is also home to two major art museums and professional ballet and opera companies, making it a prime location for arts and culture appreciators. In short, it's a great location for all kinds of people and is a popular spot with RV enthusiasts due to the presence of many highly rated RV parks and campgrounds in the surrounding area. Read on to find out more about all of the best Tulsa RV parks and choose the right one for your next road trip in Oklahoma. Offering a warm welcome to all guests and really going above and beyond the call of duty to keep everyone happy and ensure that each stay is a pleasant one, Canyon Creek RV Park stands out as one of the finest RV parks in the city of Tulsa, OK, for its amazing levels of service. This RV park is situated in a quiet northwestern corner of the city, offering a little oasis of peace and tranquility, mere minutes from the liveliness and activity of the downtown city streets. Canyon Creek RV Park is perfectly situated for both outdoor enthusiasts and city, being almost equidistant between Downtown Tulsa and some of the city's finest recreation areas like Skiatook Lake. Offering really great rates, Canyon Creek RV Park also excels as an affordable RV park in the Tulsa area. You can stay for a night at this RV park for the low fee of just $35, with weekly rates of $175 and monthly rates of just $450 also available to help long term guests save some extra cash. The RV sites feature full hook-up services and 40 foot cement slabs, offering 30/50 amp power, cable TV, water, and Wi-Fi. This RV park is pet friendly as well, so you can bring a dog along for some fun on the grassy areas, as long as they remain on a leash at all times for the safety and comfort of other guests. Suitable for both long and short term stays in the Tulsa area, Warrior RV Park is another of the top rated RV parks in this Oklahoma city. It's located on the southern side of the Arkansas River, only minutes away from Downtown Tulsa and all of the city's main attractions, restaurants, shops, and points of interest, so it's a great base camp for people wishing to explore the city and make the most of their stay in the area. The location of this RV park is actually one of its strongest aspects, as it provides a quiet and clean environment to guarantee plenty of peaceful rest in the evenings, while still being close and convenient to the center of the city. Warrior RV Park offers full hook-up spaces with free Wi-Fi access all around the park for the convenience and comfort of every guest. This RV park is open all year long and offers some simple but useful amenities as well including propane sales, a laundry with plenty of reliable, coin-operated washers and dryers, a bathhouse with clean toilets and hot showers, and lots of grassy spaces for picnics and games with your friends and family. Rates at this RV park start at just $35 for a day, $175 for a week, and $480 for a month. The Tulsa Expo Center, also known as Expo Square, is one of the most active and lively locations in the whole city. With over 350,000 square feet of space, this is one of the biggest clearspan buildings on the planet and hosts all sorts of events throughout the year, including the Tulsa State Fair. If you happen to be visiting Tulsa for an event or just want to be in the heart of the city, able to access all the main areas and attractions in a matter of minutes, Expo Square RV Park is the one for you. This RV park is right in the center of Tulsa, offering direct access to the Tulsa Expo Center and being situated just a short walk or drive from some fabulous eateries, bars, nightlife locations, live entertainment venues, and shops. 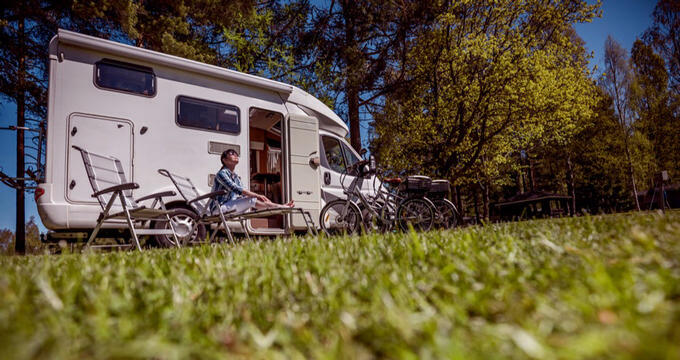 This is a relatively simple and no-frills RV park, with only the most basic of amenities like restrooms and laundry machines, but it offers a really great advantage of being one of the most central RV parks in all of Tulsa. It also provides great rates that are affordable for everyone, with a nightly fee of just $40. The RV parks around the outskirts of Tulsa tend to be slightly cheaper, but the prices at Expo Square RV Park are still very attractive, so if you want to keep your costs down and enjoy all the advantages of this great city, this could be the perfect RV park for you.